This incubator is the result of 5 years’ design and development, with field trials to bring together all the requirements the modern Aviculturist had been requesting for years. Research has shown that eggs which have smaller yolks in relation to albumen (whites) have some difficulty in developing their embryos in the early stages of artificial incubation, and from trials, it has been found that they can be brought to a successful point of hatch with more frequent turning. The A.B. Startlife 25 Mk5 Incubator has a moving plastic carpet on which the eggs are gently turned at random between spacers, the rest time between turns can be pre-programmed to last for 15 mins, 30 mins, or 60 mins, i.e. 96, 48, or 24 turns per day (a test facility of 15 secs rest time is included as standard). The humidity control represents a great step forward in the control and measurement of humidity within an incubator, having continuous monitoring of relative humidity, with proportional control easily dialled against a scale. Removable sensor unit with high stability monitoring. Pumped, self-priming humidity supply. The whole system is incorporated within the compact Startlife cabinet. 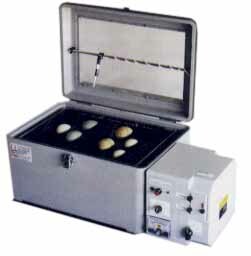 Pre programmable automatic egg turning allowing from 1 to 144 turns per 24 hour period. New improved humidity control incorporating a solid state sensor removing the need for wicks. Self priming humidity water supply pump, using water from an external container to reduce the ingression of bacteria. Egg sizes from 15 - 60 mm diameter can be incubated together simply by varying the spaces between the dividers. Digital dry bulb thermometer can be positioned above any egg within the machine. Large see-through double glazed viewing lid is fitted to the thermally efficient cabinet, which is coated in hard wearing epoxy paint for easy sterilisation.